This Leyland Borg and Beck Heavy Duty 13” Single Clutch was fitted mainly to Leyland tractors produced for the export market, where Independant P.T.O. was not important. It was also fitted to specialist machines such as Coventry Climax fork trucks, Hymac diggers, Skid units used for road rolling and tarmac laying and, from 1968 to 1977, to JCB diggers, 2B, 3C, 3D, 4D. If you have any questions about removing the clutch on your Leyland tractor give us a call, our very experienced store men and mechanics are always happy to share their knowledge! 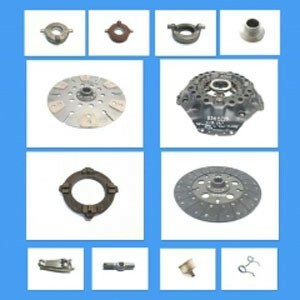 We stock all parts for 13 inch Heavy duty clutch repair or replacement. Here’s a sample of the parts added to the website this week. - BMK989R Clutch Cover Assembly.